The widest partisan divides over gun policies are on proposals to allow concealed carry in more places and to permit teachers to carry guns. 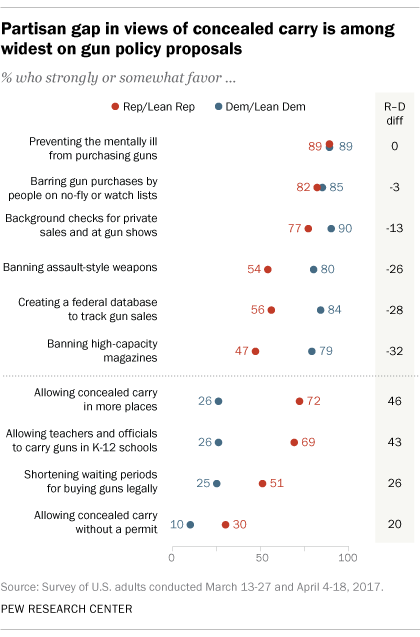 About seven-in-ten Republicans and Republican leaners favor allowing concealed carry in more places (72%) and allowing teachers and officials to carry guns in K-12 schools (69%); just 26% of Democrats and Democratic leaners favor each of these proposals. Democrats also largely oppose proposals to shorten waiting periods for those who want to buy guns legally (25% favor, 74% oppose), while Republicans are divided (51% favor, 48% oppose). There is little support in either party for allowing concealed carry without a permit, though the proposal finds more support among the GOP (30%) than Democrats (10%). Partisan divisions over gun policy proposals may reflect contrasting views among Republicans and Democrats on gun violence in the country today and on the impact of access to guns on crime and mass shootings. 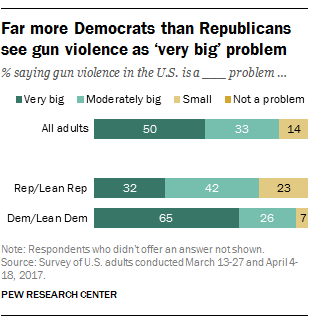 Though clear majorities of both Republicans (74%) and Democrats (92%) consider gun violence to be at least a moderately big problem in the U.S., a much greater share of Democrats (65%) than Republicans (32%) say gun violence is a “very big” problem in the country. And while both Republicans and Democrats are less likely to perceive gun violence as a big problem in their local community than in the nation as a whole, Democrats also are more likely than Republicans (54% vs. 31%) to say gun violence in their local community is a very or moderately big problem. When it comes to views about some potential contributing factors to gun violence, Democrats and Republicans deeply disagree over the degree to which legally obtained guns contribute to gun violence. About three-quarters (76%) of Democrats say the ease with which people can legally obtain guns contributes a great deal or fair amount to gun violence, compared with just 39% of Republicans. 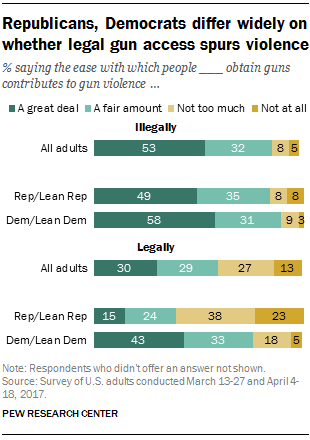 By contrast, more than eight-in-ten Republicans (84%) and Democrats (88%) say the ease with which people can illegally obtain guns contributes a great deal or a fair amount to gun violence. Republicans and Democrats also diverge in their views about how gun ownership impacts crime and mass shootings in the U.S. A majority of Republicans (56%) say there would be less crime if more Americans owned guns; by contrast, 51% of Democrats say there would be more crime if more Americans had guns. 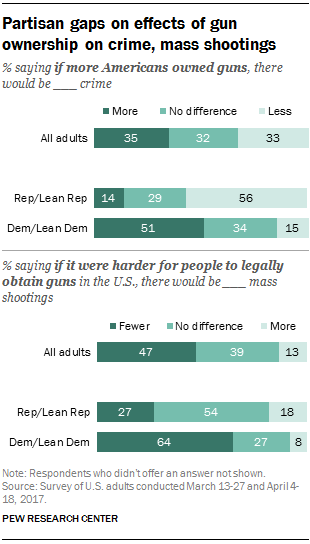 Nearly two-thirds of Democrats (64%) say there would be fewer mass shootings in the U.S. if it were harder for people to legally obtain guns; only about a quarter of Republicans (27%) say the same. And Republicans are skeptical that making it harder to legally obtain guns would have an effect on mass shootings: 54% say it would not make a difference, while 18% think restricting access to guns would lead to more mass shootings.